The 1943 session of the Legislature was the first held after the U.S. became involved in World War II. The impacts of the conflict on the Territory were substantial, creating a number of challenges to the continued operation and development of Alaska's economy. Among these was the departure of large numbers of young men for military service. Due to its location on the globe, the Territory was also seen as a likely battle front and a strategically important location for the transport and build-up of troops and materiel. As a result, the U.S. military presence in the region expanded quickly and dramatically, placing strains on the Territory's underdeveloped infrastructure. Compounding those challenges was the nationwide suspension of gold mining - an industry on which the territorial government relied heavily for tax collections - in order to force mining companies to focus on the production of metals with strategic military importance. In light of reduced tax collections and an uncertain future, the general appropriations bill for state operations fell from roughly $4.97 million to $4.34 million, or nearly 13 percent. Approximately $1.8 million of that total amount was for the operation of schools. In an effort to compensate for lost mining taxes, the Legislature imposed a $5 annual school tax for all citizens aged 22 to 55 years, except unemployed women who were completely dependent on their husbands' incomes. 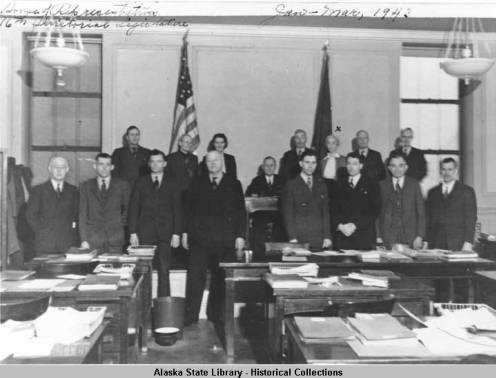 An excise tax was collected from salmon canneries, while most other goods that had been rationed elsewhere in the U.S. were prohibited from being exported from Alaska. Although the war's impacts on the Territory were substantial, the governance duties of the Legislature remained. A measure to standardize certain records of Vital Statistics was enacted, as was an omnibus narcotics control bill, and a juvenile code prescribing the care and treatment of wards of the state and delinquents. The regulatory functions of government continued to expand with the establishment of a penalty for operating a business without a license and an expansion of professional licensing requirements. The Alaska-Juneau (AJ) Mine permanently ceases operations, ending hard-rock mining in Juneau. The U.S. Military drives Japanese soldiers from the Aleutian Islands. The Battle of Stalingrad ends with over two million casualties and the retreat of the German Army. The failed Battle of Kursk becomes the final Nazi offensive on the Eastern Front. "D-Day" landings of allied forces on mainland Europe occur. Baltic States are annexed by the Soviet Union. Britain's code-breakers activate the first operational electronic computer, "Colossus," to sabotage Germany's "Enigma" encryption machine.